Background Most commonly caused by atheroma, but also heart and carotid emboli, severely raised IOP, arteritis, or rarely vasospasm (retinal migraine). Symptoms Sudden, painless, unilateral, often severe visual loss. 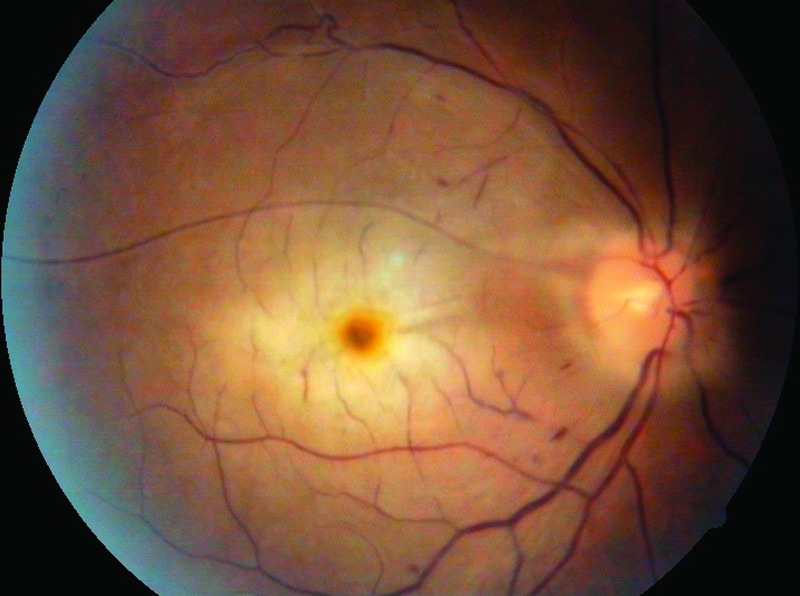 Signs Acute changes include retinal opacification, whitening, and oedema; cherry-red spot at the macula; RAPD; intra-arteriolar blood column segmentation (box-carring); possible cilioretinal artery sparing. An example is shown on. History and examination Ask about transient ischaemic attacks, cerebrovascular accidents, symptoms of giant cell arteritis, or amaurosis fugax (retinal emboli causing transient uniocular visual obscuration lasting a few minutes). Auscultate the carotids for bruits using the stethoscope bell, check heart sounds for a valvular murmur, and radial pulse for atrial fibrillation. Look for intra-arteriolar calcific, cholesterol, or fibrinoplatelet emboli. Also consider giant cell arteritis, intraocular gentamicin toxicity, and acute ophthalmic artery occlusion. Investigations Arrange BP; urgent ESR and CRP; blood sugar; FBC; lipids; ANA, rheumatoid factor, serum protein and haemoglobin electrophoresis; thrombophilia screen if suggested by history; carotid artery Doppler; fluorescein angiogram and cardiac examination for embolic source. Investigations other than basic blood tests may be best undertaken by a physician. ■ Firm ocular massage through closed eyelids for 15 minutes. ■ Stat crushed acetazolamide 500 mg p.o., Gutte. iopidine, and Gutte. beta blocker. ■ Offer anterior chamber paracentesis but explain that results are variable. If performed, prescribe G. chloramphenicol q.d.s. one week. Follow–up Review initially in 2–4 weeks. Examine for iris neovascularization. Perform or review investigations and liaise with relevant clinicians. Advise immediate ophthalmic review if visual obscuration occurs in either eye. Local policies for carotid endarterectomy vary and depend on the degree of carotid occlusion, so discuss with a vascular surgeon. Symptoms Unilateral, painless, sudden, visual field loss. Signs Retinal swelling similar to central retinal artery occlusion (CRAO, previous page), except for branch distribution. Emboli may be present. ■ Multiple episodes: consider systemic disease and urgent medical review. History, examination, investigations See CRAO, above. Cilioretinal occlusion may occur in the presence of central retinal vein occlusion and is commonly missed. Exclude giant cell arteritis. Treatment No therapy is of proven value. Follow–up Initiate medical follow-up as indicated by the investigations. Evaluate for recurrences or new disease in 3–6 months. About 80% of symptomatic cases achieve VA of 6/12 or better.